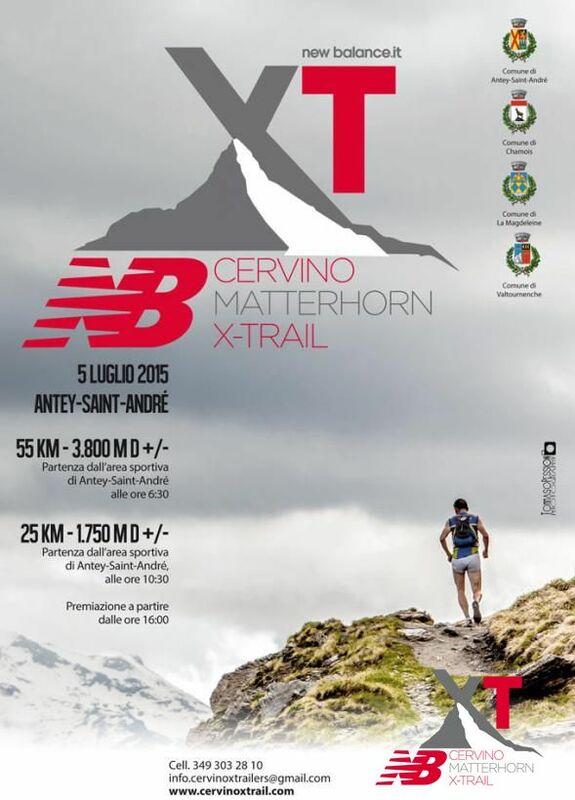 The Sixth Cervino X-Trail, now New Balance Matterhorn Cervino X-trail, second trial of the Tour Trail Valle d’Aosta, took place on 5th July last with departure and arrival at Antey-Saint-André. The weather was very hot except for the freezing level close to 5,000 m on two routes, slightly modified compared with the previous year, of 25 and 55 km with respective elevation gain of 1,600 and 3,600 m.. The edition saw the considerable and successful participation of both top runners and simple enthusiasts, thanks also to its main sponsor New Balance. This historic Boston-based company was set up in the early 20th century and produced arch supports before specializing in sports in the 1970s. 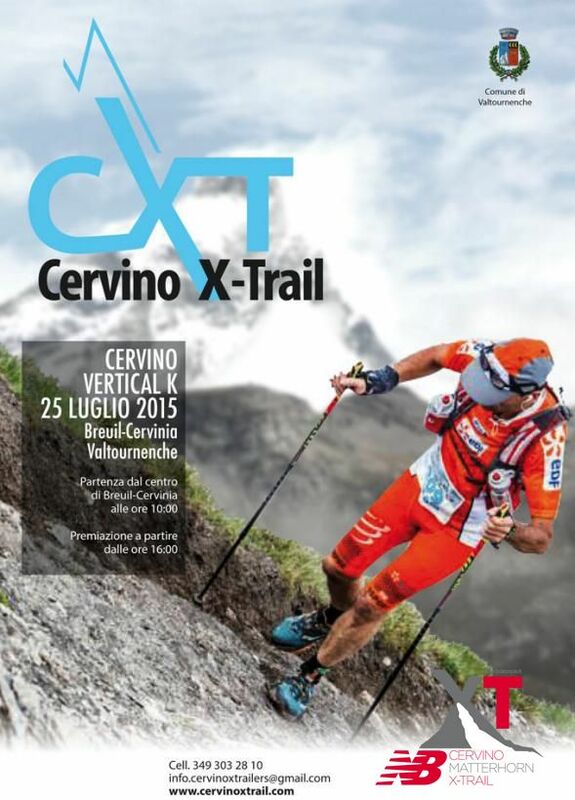 Today it is a leading global company in its sector and works in association with ASD Cervino trailers to organise the race. The Matterhorn Cervino X-Trail pays tribute to its Mountain, in the month of the 150th year of its conquest, with an important series of new features; the most important is the route which changes and re-embraces the village of Valtournenche on its left orographic side, maintaining the breathtaking passages of Mount Zerbion and Mount Tantané, passing through Col des Fontaines to reach the magnificent rural village of Cheneil with new unique views of the Matterhorn/Cervino. The race in the words of Luca Casali: “The Cervino X-Trail should have been a head to head between Franco Collé and Dennis Brunod, but the flu got the better of the runner from Gressoney, winner of the last Tor des Géants, so Brunod was happy to oblige: he took the race immediately in his stride and crossed the finish line of the 55 kilometre race of the only Italian trial of the Italy Skyrunning Series in a time of six hours 28’14”, 10’36” ahead of Maxim Ioan and 15’31” of Michael Dola. The conditions were difficult: “The heat made it a difficult race – said Brunod after cutting the finishing line -. I tried to set my pace and the feelings were good. I’m satisfied”. It was a true battle for fourth place, won by Hungarian Csaba Nemeth, 16’50" behind the winner. Marco Mangaretto with a time of 17’53”, came fifth. It was an open battle among the women between Sonia Locatelli, the new name of the trail, and Sonia Glarey. Locatelli ran a fast race coming in tenth place overall (one hour 9’38” behind Brunod) and preceded Sonia Glarey by 2’20”. It was the first win for 35-year old Locatelli. She chose a high level stage and an outright adversary to achieve it. “I'm thrilled she said - It means a lot to me. I have never won a trail and having done so after competing against an athlete like Sonia Glarey has been an honour”. Glarey: “Locatelli was brilliant. We ran the first part of the race together; then, on the second climb, I had a few problems and she got a 10' lead. I managed to reduce the gap and in the last descent I even thought I could catch her, but she was stronger.We both ran a great race”. There was no battle in the 25 kilometre race. Nadir Maguet was no match for Andrew Davis. The racer from Valle d’Aosta came second with a time of 7’40”. Then a gap: Lorenzo Villa came third, at 21’29”; Fabrizio Bernabei fourth, at 21’36”; Alfonso Bracco fifth, at 22’25” and Marco Bethaz sixth, at 22’39”. The race was won by Serena Natolini, who came 41st overall. She preceded Jessica Gerard from Valle d’Aosta by 7’ and Gabriella Boi, third at 17'. 700 trailers were at the starting line of the 55 and 25 kilometre route and the competition wants to develop. “We are very satisfied - said Enzo Scipioni, head of the organizing committee -. We got great support from all the villages involved by the race (Antey-St-André, Valtournenche, Chamois and La Magdeleine). The Italian circuit of Isf gives us excellent visibility but we want to develop and aim higher”. (La Stampa).